He is how we got here, since everything was made by Him. 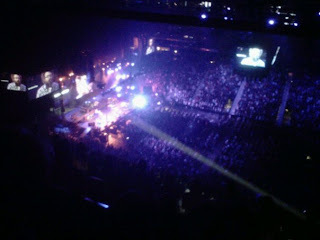 We're at a gathering of college-age people in Altanta, Passion 2011. There are 24,000 Jesus followers here. But the main One who is here is Jesus. The spotlight is on Him! He's the One we are leaning our lives into, even while He is giving us the power to run towards Him. And, He's the One we are longing to look like, to live like, to serve like, to love like! We're starting day 3 of Passion 2011. Today and forever, let's be a people longing to look like Jesus!